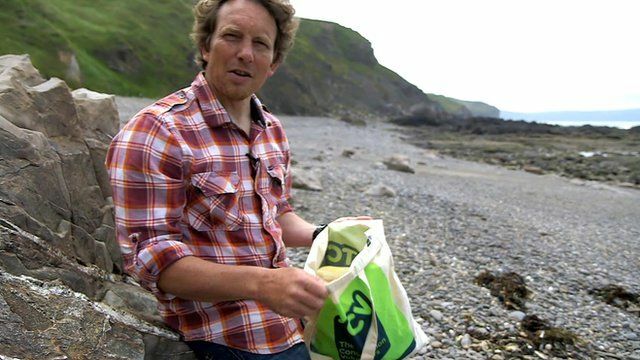 How to clean a beach in two minutes Jump to media player Every time Martin Dorey visits a beach, he spent two minutes picking up marine litter. Now the hashtag #2minutebeachclean is going global. Warning over litter on beaches Jump to media player Litter levels on Welsh beaches will only fall if people cut the amount of rubbish they drop on the street or flush down drains, campaigners say. Every time Martin Dorey visited one of his local beaches, he spent two minutes picking up some of the harmful plastics and marine rubbish that had washed ashore. Then he had a simple idea. What if everyone did the same? So Martin used social media to spread the idea. And before long #2minutebeachclean started appearing on Twitter and Instagram around the World. Martin took BBC News along to a beach near Bude in Cornwall to see how much litter could be picked up in two minutes.